Authored in 1968, the journal depicted above was kept by Don Fedynak during his service in the Vietnam War as a1st Lieutenant in the 221st Signal Company, a sector of the 1st Signal Brigade. Fedynak writes of an internal struggle in which he attempts to decide the importance of serving his country versus serving his conscience. This same struggle was felt by young men and women throughout the home front, as evidenced by the heated political climate during the Vietnam era and public demonstrations that were held throughout the country. Fedynak’s profound belief that America’s involvement in Vietnam was unjust was not unique as it was shared by hundreds of thousands of Americans back home. Manifested in mass protests and peace marches, the sentiment of frustration and anger spanned across cities and college campuses. In 1967 alone, a collective of 400,000 people marched in anti-war movements in New York and Washington. The rapid escalation of anti-war activism quickly alarmed the Nixon administration, which later became the driving influence for the “Great Silent Majority” speech that was televised nation-wide on November 3rd, 2017. Nixon’s speech urged for the support of pro-war activists in order to effectively move forward with diplomatic negotiations and Vietnamization, the process of creating an increased reliance on South Vietnamese forces that would in turn allow the US to withdraw troops and minimize involvement. The speech received a myriad of reactions, spanning from a supportive letter written by Gerald B. Spinn to a letter collectively authored by servicemen in Fort Bliss, Texas in 1969 condemning the message of a “blood bath” in Vietnam. As the war dragged on, the conservative pro-war activist movement became riddled with doubts and divisions while the anti-war movement grew in presence and strength. 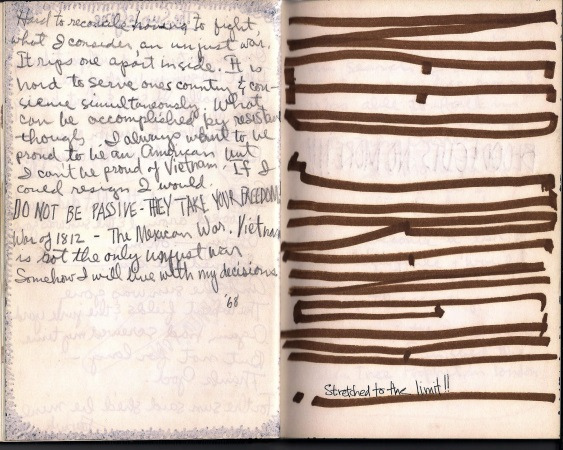 The internal conflict documented in Don Fedynak’s Journal and present in American society throughout the late 1970s left scars that are still evident through modern discourse. Majerol, Veronica. “The Vietnam WAR.” New York Times Upfront, April 21, 2014. Accessed August 8, 2017. Hope, Bob, Jules Feiffer, Leonard Bernstein, Gloria Steinem, and Abbie Hoffman. “Hope for America: Performers, Politics and Pop Culture Polarization in the 1960s.” Library of Congress, July 11, 2010. Accessed August 08, 2017. http://www.loc.gov/exhibits/hope-for-america/polarization-in-the-1960s.html#obj4. “Silent Majority.” Richard Nixon Presidential Library and Museum. Accessed August 10, 2017. https://www.nixonlibrary.gov/forkids/speechesforkids/silentmajority.php. ; 32 Servicemen -. Fort Bliss, Texas to President Richard M. Nixon. November 26, 1969. Fort Bliss Army Installation, El Paso, Texas. Accessed August 10, 2017. https://www.nixonlibrary.gov/forkids/speechesforkids/silentmajority/silentmajoritycon.pdf. Scanlon, Sandra. “Domestic Support for the Vietnam War and the Making of Modern American Conservatism.” University of Massachusetts Press. 2017. Accessed August 10, 2017. http://www.umass.edu/umpress/title/pro-war-movement.